Housed in an Eclectic style building from 1868 that was formerly the Naval Club, the Museu Naval e Oceanográfico (Naval and Oceanographic Museum) is dedicated to the seafaring history of Rio de Janeiro and the Brazilian Navy. Housed in an Eclectic style building from 1868 that was formerly the Naval Club, the Museu Naval e Oceanográfico (Naval and Oceanographic Museum) is dedicated to the seafaring history of Rio de Janeiro and the Brazilian Navy. The ground floor displays the permanent exhibition on ‘O Poder Naval na Formação do Brasil’ (Naval Power in the Formation of Brazil) exploring the naval history of Brazil, from colonial times up to World War II. 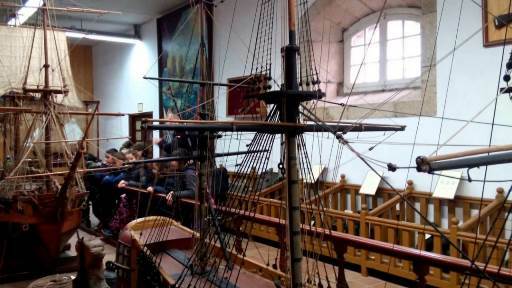 The museum displays model ships, ship figureheads, submarine torpedoes, cannons, guns, and shipwrecks, along with paintings of naval battles, uniforms, medals, maps and historic naval documents. One of the main highlights is a letter from French naval officer Nicolas Durand de Villegagnon written in 1557, describing Guanabara Bay at the time.